We’re happy to visit your home and determine from our meeting your own specific requirements. This will enable us to create a beautiful and unique kitchen design that will meet your individual needs. Our experienced designers will present a detailed design to you. This professional service will help you clearly understand how your new kitchen will operate and look. Every kitchen we design not only looks superb, but it is also sturdy, practical and very user friendly. Let us help you put all the right ingredients together to create your ideal kitchen. 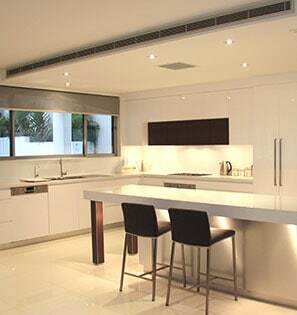 At Cummins Joinery we employ our own highly skilled and qualified trade’s people to carry out work on your new kitchen and you can be rest assured that professional, friendly installers will leave your home as neat and tidy as they found it. Cummins Joinery kitchens are all manufactured in our own modern factory in Peakhurst. This allows us to ensure the very best quality control is maintained and ensures that we can meet manufacturing timelines for your project. Cummins Joinery offer a 7 year written warranty on all our cabinetry. We also offer a lifetime warranty on all our BLUM doors and drawer runners. Your kitchen project will be check measured and fully project managed to ensure that all the work carried out by Cummins Joinery not only meets our own high standards and is completed on time, but eliminates all potential stress you could experience from coordinating the project yourself. Mr Gary Cummins and his wife Elsie retired from the business in January 1994. At this time Geoff and his wife Lisa took over full operation of the company. Geoff’s showroom reflects his eye for detail and you can be certain that this is evident in every project his company manufactures. We enjoy working with timber, veneer and other exotic materials. Our expertise is not limited to building kitchens. We also produce vanities, wardrobes, outdoor kitchens, laundries, entertainments units, studies and other custom joinery and commercial furniture. Cummins Joinery only employs qualified staff in our factory, ensuring us the resources to tackle large joinery projects and complete them within an agreed time frame. We also design, manufacture and project manage kitchen, bathroom and building renovation projects. Possessing a full builder’s licence and providing home warranty insurance enables us take your total renovation project from concept to completion.